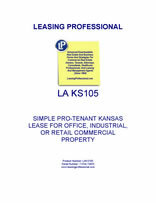 This form is for a single tenant Kansas lease where the tenant has superior leverage. It gives the tenant the right to use the premises for "any legal use," and has very abbreviated remedies for the landlord in the event of a tenant default. It is also pro-tenant in character because of the clauses it does not contain which customarily appear in pro-landlord forms relating to remedies and a variety of other pro-landlord provisions. Kansas is in the geographical center of the continental United States, with the “western” state of Colorado on one side, and Missouri to its east. It is a decidedly flat state and its sources of industry include, among others, cattle, wheat, corn, and aircraft and automobile manufacturing.